This will not become a recipe blog as I am more the sort of person who stands in front of a piece of art going, “Oooooh,” instead of being the sort of person who spends 5-years trying to paint the sound a happy mouse makes and cutting my ear off when I can’t come up with the right shade of blue or have a showdown with my rival. Basically I’m more a devourer of cookies than a baker of soufflés. Nonetheless, as I do enjoy food I find the time to pay the occasional homage to a good dish. Let’s be honest, we’ve all passed the poultry section of any supermarket and seen those teeny tiny dwarf chicken bodies and thought, “I would love to have one of those on my plate as then I could pretend to be a chicken-eating giant,” however the off putting thought is that because they’re smaller somehow they’re going to have 10 times the bones, and eating a tiny chicken will be like having a toothpick party in my mouth. Well, The Hublet saw some of the bad boys chilling (literally) at the supermarket and brought them home, a fact I didn’t discover until I saw two teeny tiny body bags in the freezer. Although there are numerous arguments as to their origins, it would appear that CGH’s are the hipsters of the poultry world, being specifically bred as a specialty fowl that would appeal to foodies due to being easier to fit on a plate and also be a predominately white-meat bird. Some cite chicken king Donald John Tyson as their creator, claiming that he left a White Rock hen and a Cornish hen in a room with candles, a leopard-print bed and Barry White playing in the background, while others believe that husband & wife duo Alphonsine & Jacques Makowsky match-made a steady stream of different chickens in a lava-lamp-lit room with Jimi Hendrix playing and incense burning to create the breed. 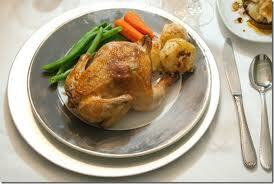 They are also known as Rock Cornish hens, Cornish hen and Rock Cornish hens. They are sometimes considered to be chickens created for people who are just too greedy to share. Regardless, they are abso-freaking-lutely delicious. Hublet kept it simple as this was our first introduction to them and he didn’t want the flavour of the bird to be lost, so he roasted them with the bare minimum of herbs and seasoning, and regularly basted to ensure moistness. When he put one on my plate I tore that sucker apart and it was glorious, and I honestly felt a little embarrassed that I’d avoided buying and roasting one of these before based on the vague thought that smaller = more bones. Ok, and the photo above is completely NOT MY CHICKEN as the way I went at my poor little bird it was a wonder there wasn’t chicken stuck to the ceiling. It would appear that CGH’s get my carnivore juices flowing and I do not hold back when it comes to attacking and devouring my prey. I know this post isn’t too impressive as it’s not as if I took my first bite of Fugu, rocky mountain oysters, pigs feet or haggis, but it was an excellent meal prepared by my live-in help that was a joyful delight. Besides, how often do you get to play carnivore with your teeny tiny dinner?